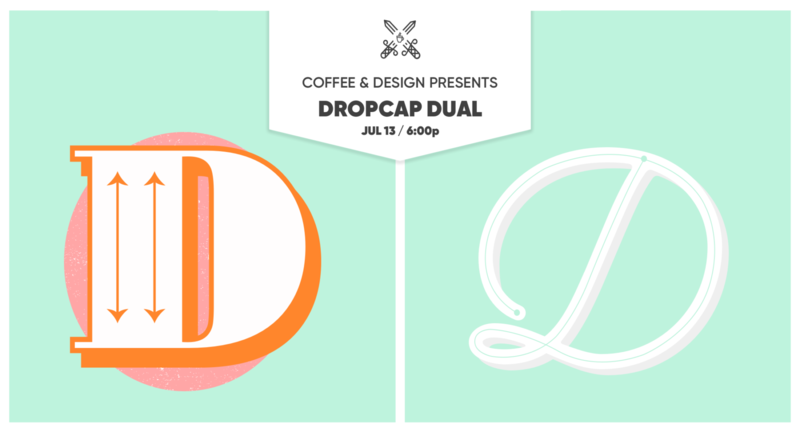 We’re stoked to announce our very first ever Dropcap Dual! You may be familiar with TypeFight, and we thought: why not go crazy with that idea and pin two designers against each other to design a letter in twenty minutes all the while having every click on display!? Too crazy or just the right amount? You’ll have to decide for yourself! Speaking of deciding, you’ll also get to decide the winners! Of course there will be some booze and snacks because duh. Interested in being a competing designer? Make sure you still rsvp, but SIGN UP HERE!! We can take the first 8 designers to sign up, those after will be waitlisted in case someone has to drop out and then will be at the top of the queue for the next dual! Whether you’re dualing or spectating, grab a friend and join us for a beer and good time! An enormous thank you to Sprint Accelerator for sharing their awesome space with us! 6:30 First dual kicks off and runs in 20 minute intervals.